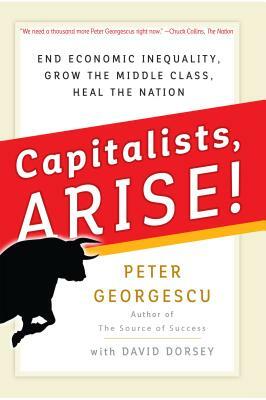 Peter Georgescu arrived in this country as a penniless Romanian refugee and rose to become the CEO of Young & Rubicam. This is why he’s so heartsick that with flat wages, disappearing jobs, and a shrinking middle class, his kind of rags-to-riches story doesn’t seem possible now. But he has a message for his fellow CEOs: we’re the ones who must take the lead in fixing the economy. Marshaling deeply sobering statistics, Georgescu depicts the stark reality of America today: a nation with greater wealth inequality and lower social mobility than just about any other country in the developed world. But the problem isn’t that free-market capitalism no longer works—it’s that it’s been hijacked by shareholder primacy. Where once our business leaders looked to the needs and interests of a variety of stakeholders—employees, community members, the business itself—now they’re myopically focused on maximizing their shareholders’ quarterly returns. Peter Georgescu is chairman emeritus of Young & Rubicam. He served as the company’s chairman and CEO from 1994 until January 2000. In recognition of his contributions to the marketing and advertising industry, he was elected to the Advertising Hall of Fame in 2001. Georgescu has been the director of the board for eight public companies, among them Levi Strauss, IFF, Toys“R”Us, and EMI Recorded Music. He is currently vice chairman of New York–Presbyterian Hospital, a trustee of the Paul and Daisy Soros Fellowships for New Americans program, and a member of the Council on Foreign Relations. He is the author of two previous books, The Source of Success: Five Enduring Principles at the Heart of Real Leadership and The Constant Choice: An Everyday Journey from Evil toward Good. David Dorsey is the author of the critically acclaimed The Force and The Cost of Living. The Force was included in The 100 Best Business Books of All Time. Dorsey is coauthor, with Peter Georgescu, of The Source of Success and The Constant Choice. He has written for Fast Company, Esquire, Worth, and a variety of other publications. 2018 Independent Publisher Book Awards bronze medalist in the Business/Career/Sales category.